Herzi, a very likable obese man, living in a small town in Israel , gets mad when he is thrown out of his Dieting Club by its skinny tyrannical leader who calls him a whale cos he is actually putting on weight, and then he gets fired from his job as a Chef at a Salad Bar because of his vast size. Desperate to find work he ends up as a dishwasher in a Japanese restaurant and once there he discovers by chance, Sumo wrestling. This, his new work colleagues tell him, is not just wrestling with vastly overweight guys: it’s an art, and it’s a skilled sport and most importantly, a route to self-esteem. 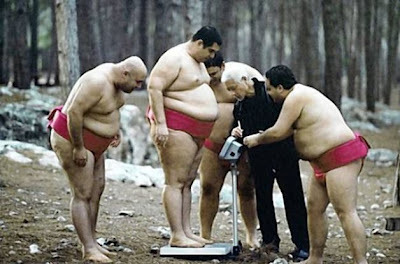 Herzi persuades his chubby chums to join him and together under the tutelage of the Restaurant Owner, a former professional Sumo referee, they train them for a tournament in Japan. There’s some great wee touches: a budding romance; a closeted gay man who is so happy to discover the world of ‘gay bears’; and then there is Herzi’s overbearing but hysterically funny mother …’even if you’re on a diet you have to eat’ she claims piling mountains of food on his plate. And the sight of them all out of their comfort zone wearing their bright red mawashi is a really funny sight. This is the gentlest of movies and unlike other comedies about being fat, this is a story about self-acceptance and treats its five main characters with respect. It’s a tale about a coming out’ of a different kind – overweight people learning to accept themselves. And the fact that it really is OK to be happy too.